eConowind BV is a Dutch company, daughter of Conoship international in Groningen and HCP BV in Amerongen, fully dedicated in developing a wind-assisted propulsion unit: the eConowind-unit. This eConowind unit consists of 2 Ventifoils folding from a sea container, which can be placed on many different ships. 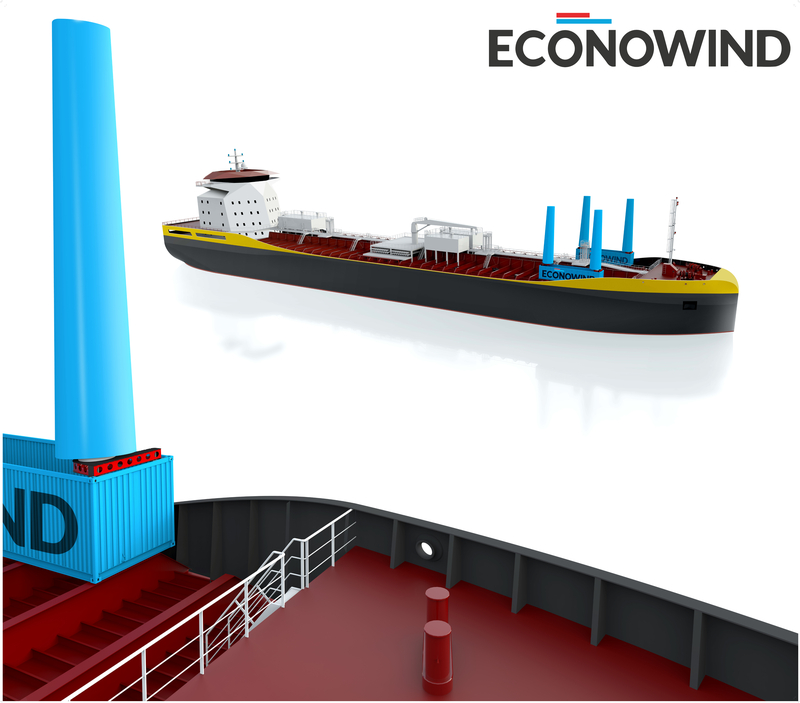 eConowind BV offers an innovative solution to realize a foldable wind conversion unit, helping propelling a coastal vessel by “automatic sailing”. A container will be placed on deck of the vessel, folding out 2 “sails” (Ventifoils) on captains demand and further sailing automatically. The “sail” is a wing shaped element using the modern innovations in aerodynamics creating high propelling force relative to it’s size. The wings can be rotated automatically to find the optimal angles relative to the apparent wind. The generated force will be transferred right into the deck and thus helping with propulsion. To maintain the ships optimal speed, the motor power can be reduced. The goal of the unit is to reduce costs and CO2 emissions by reduction of used motor power, while keeping the same optimal speed of the vessel. Theoretical studies in a studied voyage from Rotterdam to Helsinki on an average wind-chart estimated to save 25% fuel consumption. While experiencing headwinds, the unit will fold in not giving extra drag. Increased drift due to forces perpendicular to the ship has been studied to be minimal.